From the engine side of this green machine equipped flat with a capacity of 124.6 cc, air cooled, 4 stroke, 4 speed gear with a rotary system. 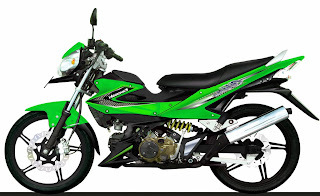 that makes the difference is the location of the tank is not under the seat or in front under the steering wheel like the Kawasaki ZX 130, but benar2 amid!, so no need to come down from the motor if you want to fill bengsin. 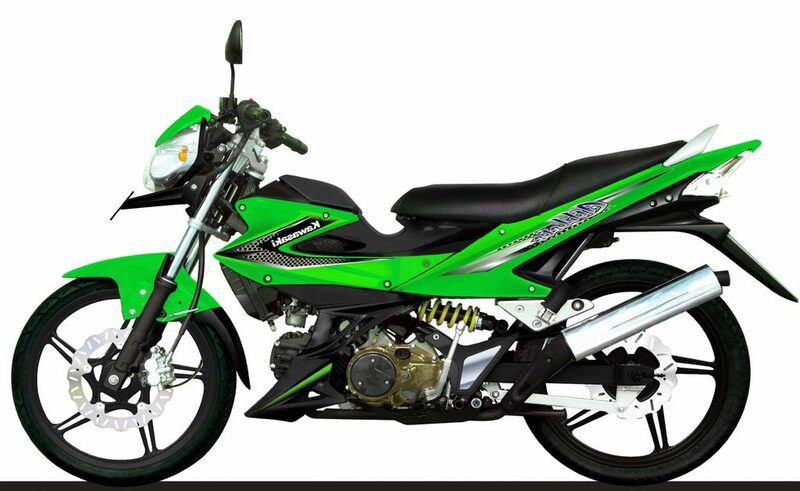 This is a great idea, combining comfort and ease of filling motorcycle motor sport bengsin style. Given the migratory tanks, otomaris provide more places for luggage under the seat. Indicator panels still use the old type, the digital speedometer is not there, but this bike has been equipped with racing wheels and double disc, and for the rear suspension uses a mono-shock with parallel link system unitrack suspension. In terms of competitors, with prices ranging between Rp. 14jt(indo) an athlete competing against Suzuki Shogun RR, and CW Supra X125.